Events 10/5 – 10/11: Philly Pigeon Poetry Slam, Collingswood Book Festival, Old City Fest, YèShì Chinatown Night Market & More! The latest and greatest things happening in Philly from Friday, October 5 to Thursday, October 11. Share your event by tweeting us @citywidestories or tagging us on Facebook. Prepare to be inspired by some amazing textile artists. Broad Cloth is a celebration of pattern, color, and traditional textile techniques by 20 female artists from Philadelphia! Calling all poets! 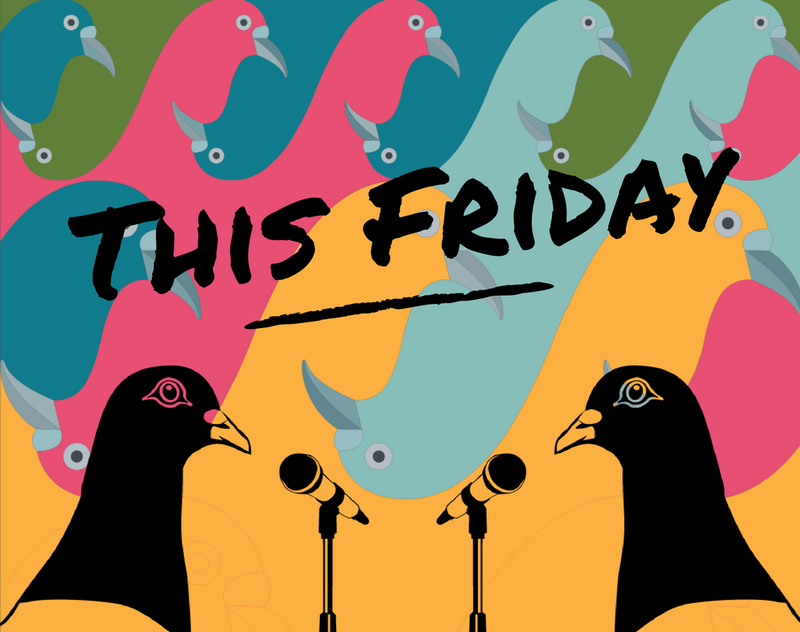 Come out to the Philly Pigeon Poetry Slam, a competition between poets performing original work judged by members of the audience. You will also hear from the featured artist, Ursula Rucker! Read more about Ursula Rucker in our latest feature here. You won’t want to miss the the longest-running, largest literary event in the Delaware Valley! Haddon Avenue will be filled with authors and speakers for adults and children, as well as booksellers, storytellers, poetry readings, workshops, exhibitors, kid-friendly activities, and entertainment for all ages. Explore the accomplishments and continued presence of indigenous peoples in Philadelphia through collaborative art activities, workshops, presentations, guided tours, food, drumming, and dancing. This is part of the Art@Bartram series that celebrates the Schuylkill River trail and its surrounding landscape. Barnes on the Block returns for a free block party! Dance in the parking lot to music by DJs Rich Medina and King Britt, grab a snack from local food trucks, and have a local brew in the beer garden from Dock Street Brewery. Don’t forget to head inside the museum to see an augmented reality mural experience created in tandem with Mural Arts! Celebrate and explore America’s most historic square mile during Old City Fest! You can expect live music, runway fashion shows, a family fun zone, pop-up street performances and a wide array of food, beverages, art, craft and retail shopping, with 100+ Old City vendors participating. Celebrate the women of Philadelphia keeping the beat! The 5 year anniversary celebration of Drum Like a Lady kicks on Sunday October 7th at the Barnes’s PECO Free First Sunday Family Day, where they will have percussion performances, as well as other curated activities during Sunday’s free admission! The winners have been announced for the Storefront Challenge, a citywide contest to recognize design excellence in storefront facade improvements. Celebrate the winners and get a chance to meet those investing in Philadelphia’s neighborhood commercial corridors at the 2018 Storefront Challenge Awards Celebration! Get some fresh air and raise funds for SEAMAAC at their Fun at the Farm fundraiser event! There will be Burmese Asian Fusion and Indonesian food being served (yum! ), a beer garden, live music, and an opportunity to take a tour of the farm. You won’t want to miss this! Philadelphia Chinatown Development Corporation (PCDC) presents the annual YèShì Chinatown Night Market on Thursday, October 11th. There is sure to be mouthwatering food, arts & crafts, and entertainment, and did we mention the food? Come out and spend a fantastic evening in Chinatown!